Garlic and Chive Cauliflower Mash is versatile and pairs well with a wide range of dishes. And since it comes together quickly and easily, it is perfect for those busy weeknights when you need to get a healthy dinner on the table fast. It is SO easy to make! 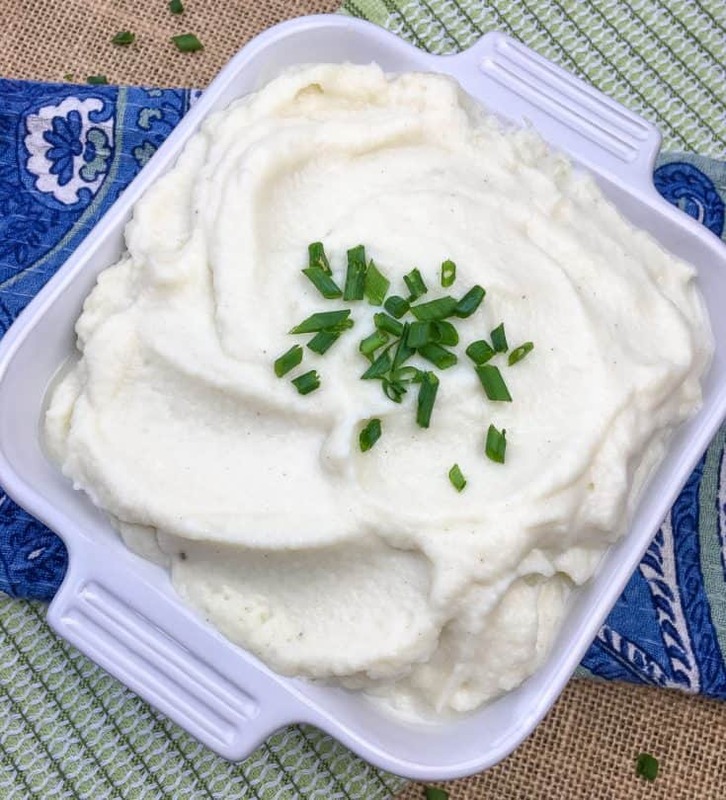 With just a couple of steps and less than 30 minutes, you can have this hearty and flavorful Garlic and Chive Cauliflower Mash on the table. It really is as simple as steam, blend and serve. This dish is tasty and healthy, thanks to nutrient-rich cauliflower. Loaded with vitamins and minerals, one serving of cauliflower contains 77 percent of the recommended daily value of vitamin C. It is also an excellent source of fiber and rich in antioxidants. Garlic and Cauliflower Mash is vegan, low carb and gluten free, making it compatible with a wide range of dietary considerations. That makes it a dish you can serve up for all your friends and family, including those following popular eating plans like Keto, Whole 30, and Paleo. Step #1: Place the cauliflower florets and the garlic cloves into a steamer basket set over a pot of gently boiling water. Cover and steam until the cauliflower is fork-tender, around 15 minutes. (note: steaming the garlic along with the cauliflower will remove the raw edge and make it more tender). Step #2: Then transfer the cauliflower and garlic to a food processor or blender and add the olive oil, almond milk, garlic powder, and onion powder. Step #3: Season the mixture with salt and black pepper and process until smooth and creamy. Taste and adjust the seasonings, as desired. Step #4: Serve topped with fresh chives. 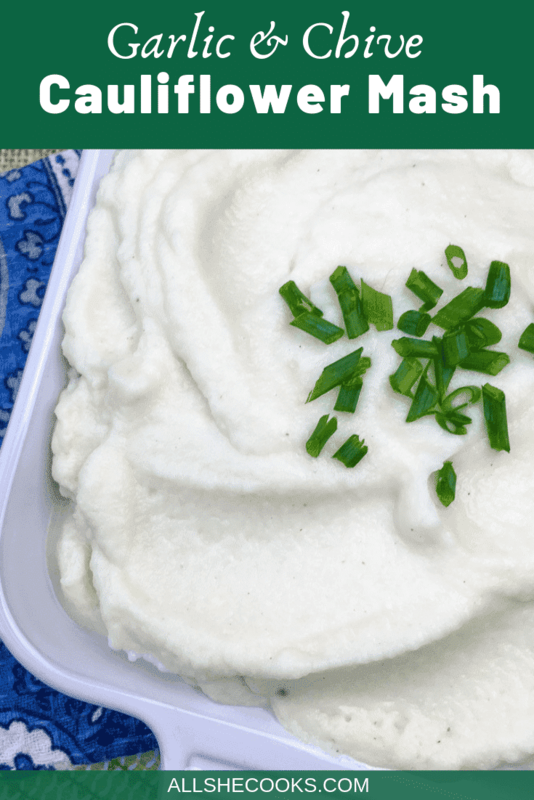 If you love this Garlic and Chive Cauliflower Mash, you’ll want to check out these other cauliflower recipes that taste good and are good for you, too! 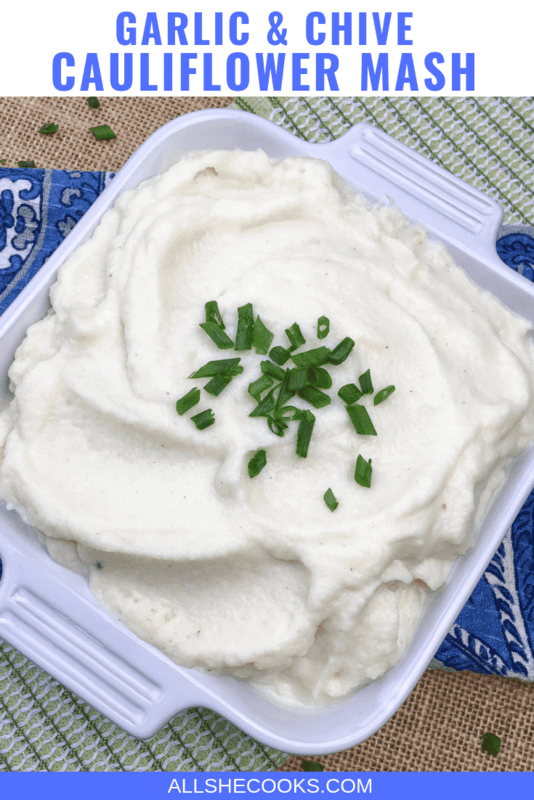 Garlic and Chive Cauliflower Mash is a healthier version of a comfort food classic! Transfer the cauliflower and garlic to a food processor or blender and add the olive oil, almond milk, garlic powder, and onion powder. Season with salt and black pepper, to taste, and process until smooth and creamy. Taste and adjust the seasonings, as desired. Tip: Steaming the garlic along with the cauliflower will remove the raw edge and make it more tender.